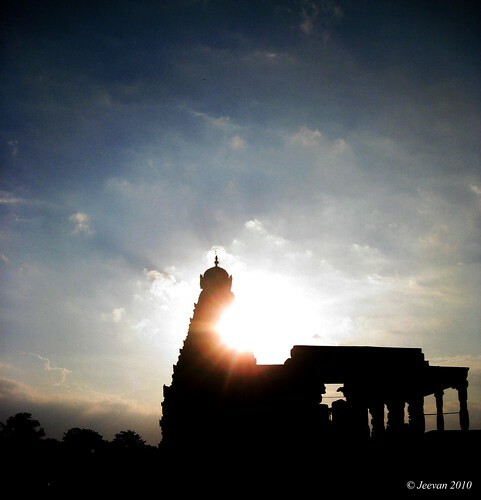 The big temple in Thanjavur which mark the thousand years of it’s built shines to the sunset. Captured from my trip to tanjavur lately and it was a great structured to be remind and admire the beauty and grand architecture. It was my long time wish to visit thanjavur big temple and this time been celebrating its millennium year, I wished to mark my existence on its millennium year and thus happens this trip. It was a weekdays journey we began on 18th Monday October and it was a planned travel to thanjavur, palani and kolli hills. It was partially wonderful and painful journey, because of my slightly down fall from wheels(chair) which disturbed the hand movement and pain still continues to strain me, but most of all it was an interesting and relaxed journey without much hustle and bustle. 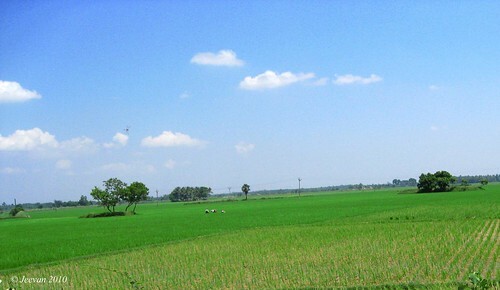 Thanjavur which is said to be rice grain repository doesn’t showcase me much paddy fields or I didn’t went around the place to view more green fields, but it was good to see some vast paddy fields somewhere with no disturbance like pump sets or farm wells that interrupted like many other places and its almost irrigation is done by Kaveri river water that connect through canals. 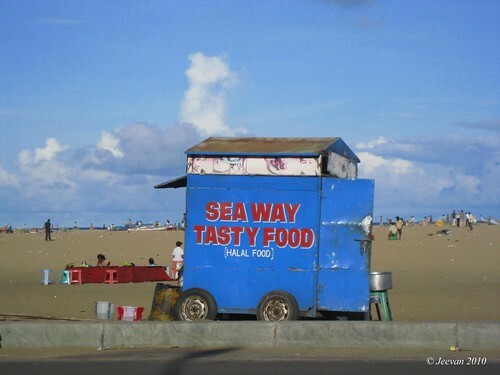 We shared two places in thanjavur to stay and one was govt. guest house and the other was hotel lion city. The hotel room was in first floor and just been paid, my grandparents stayed there and we moved to guest house which was beautiful and nice. 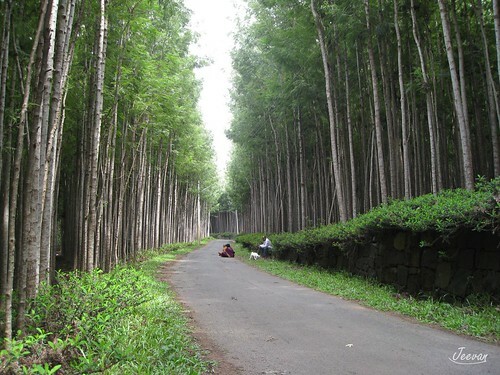 From there we move to palani, where my father wanted to go for sometime even we visited it when we (me and bro) were small kids, where we cried and fought in whom to go baldhead first. We just went near the winch and I told my parents already that I am not gonna come to the hill temple, but they wished me to come, and canceled finally only knowing that taking me to the hill top is impossible since the winch is too small and stands slantingly. In meanwhile we went around the palani sometime and discover the places nearby and enjoyed by touching the foot hills of kodaikanal which is 12kms from palani. let we talk more about it sometime… little struggling to write more since the fall down aches remains in shoulder. 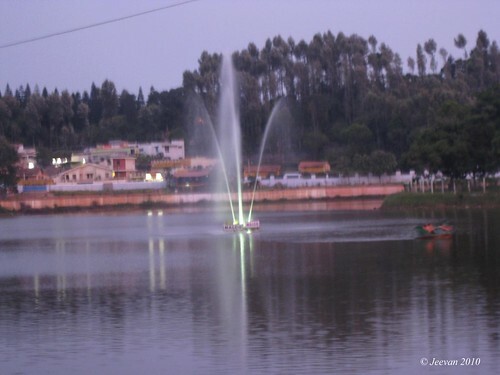 There’s nothing greater to describe about this park which lies in the center place of yercaud, but it has something to welcome visitors those visit yercaud. After searching for a botanical garden indicated by the sign board, which was nothing but a horticulture center that one needs to climb steep and steps, thus we landed in Anna Park. This is a small park like garden with some beautiful flowers and roses in varies colors are the main attracts of the park. 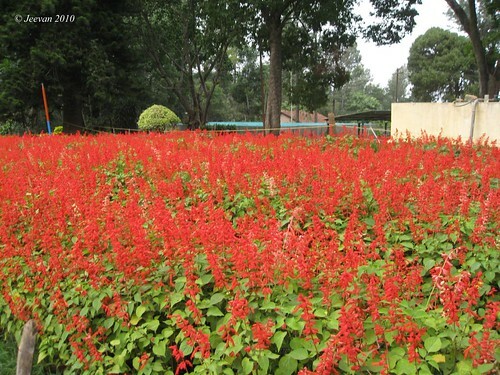 One part of the park decorates the red salvias, which looks like red carpet spread for visitor’s sight. 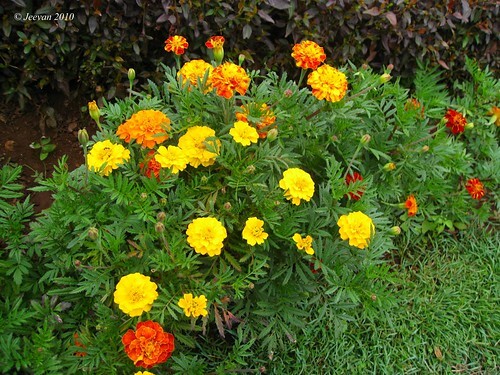 In between shines the marigold alike the yellow bulbs and there are dual code marigolds too with red petals around it. We head there in evening and it was cool enough to carry away in breeze since it looks like to drizzle quickly so as the dark clouds were covering the sky. We relaxed there some time on the green carpet and it wasn’t quiet as it was nearby roadside and summer time to be, so little crowded and children making noise by enjoying the slide. 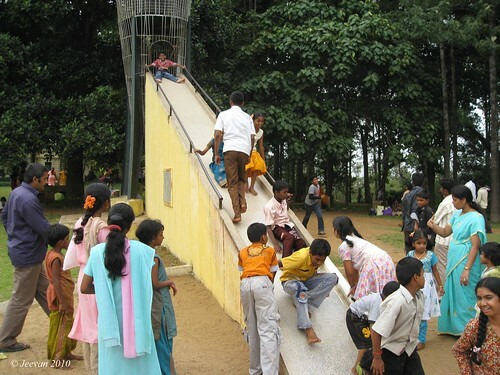 The slide was something has the same way to climb and slide thus the cage like ladder to climb was locked, it was amuse and disturbing to see how children balance in sliding and slip down in unable. There were many white roses, some wild and pure white in bunches. There was a pretty orange rose with an umbrella like petal partly covering the pollen and it was interesting to see and capture a bee that come across collects the nectar and flew away instantly. The fountain in the park center splashes nicely for some time goes off immediately before me likely to go near to enjoy the sprinkle. 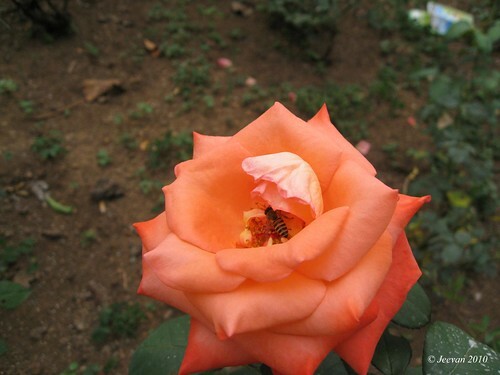 The park also exhibits nursery with yellow, orange and red flowering plants which could grow perfectly in hills alone, disappointed me later buying few roses and marigold in which only a rose blooms at home. Even it sounds noisier around the park, the three guys uncared about what’s happening around, enjoys there deep slumber in the lawn, beneath the decorative areca palms. 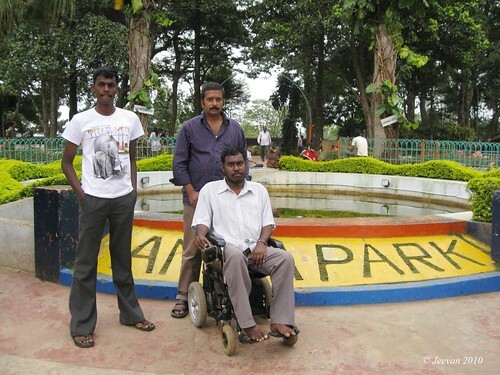 While visiting the park we received a call from a cousin, and when talking casually we surprise to know that they were too in yercaud. It was a great coincident and we know they were on traveling, but never thought we would meet at some point. After having cup of coffee and by receiving them and chatting over our journeys we apart to stay there and they continued their travel to Salem. Later we spent some time in the lake bank and looking over the pedal boats rolling their latter rounds around the dazzling fountain in center of the lake. 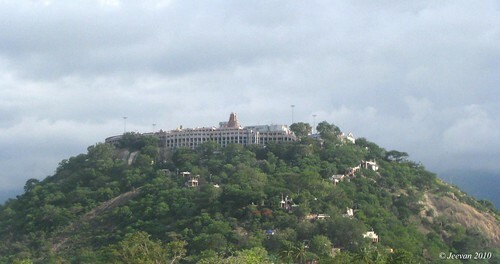 We spent there almost it went dark and moved to room only after clouds drive us before the thunder storm struck the yercaud that night. and fast track bike riders. spouse with Sunday for rupees 10. 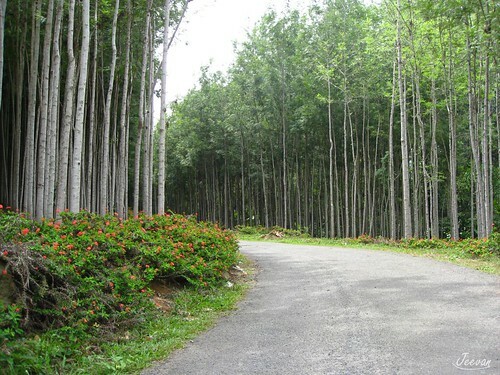 The silver oak grove in yercaud is very quiet and pleasant. Lying on the way to manjakuttai viewpoint to the east of yercaud, the place is simple cool and green. 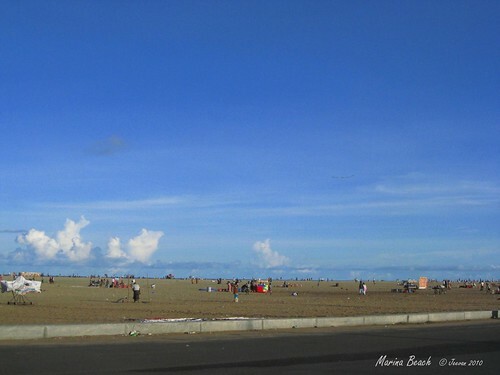 I know this place already through a tourism program on TV and remind to check and while leading manjakuttai (yellow tank) I saw this place and clicked few snaps. 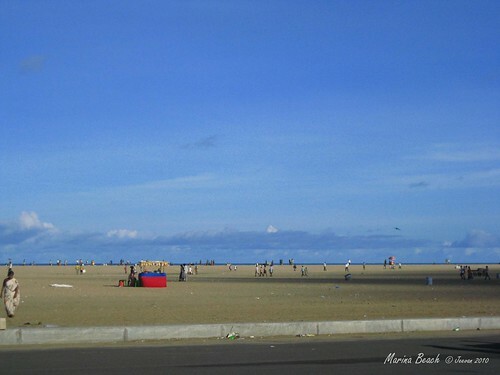 After while return from manjakuttai – a sunrise view point which is spectacular for its early morning views and it was simple a viewpoint for us who visited it nearby noon – I wished to spent sometime in the grove and so stopped the vehicle and relaxed a while moving into the grove’s in wheels. 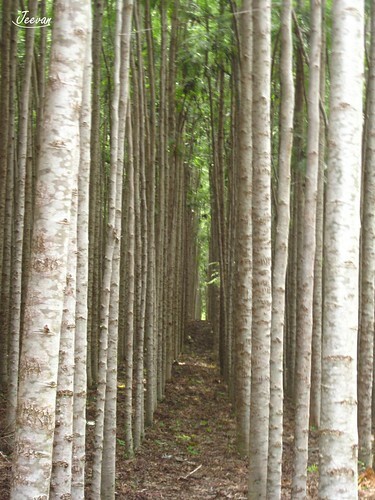 The silver oak trees are well planted with certain distances in narrow lines neatly and cut off branches for nearly bottom half of the trees. It seems like the oak trees are still under development for the pepper creepers to climb on in future. As it was noon and time for lunch, we decided to bring the food to this place as it is 5 km to yercaud and so leaving us, cousins went to collect food parcels from the hotel. Meanwhile it was time for me to examine and take a leisure ride on wheels along the stretching grove’s slowly and inhaling the cool breeze and gazing the clean and green environment. The Crown of Thorn is everywhere, which is pretty and poisonous, protects the grove as fencing. 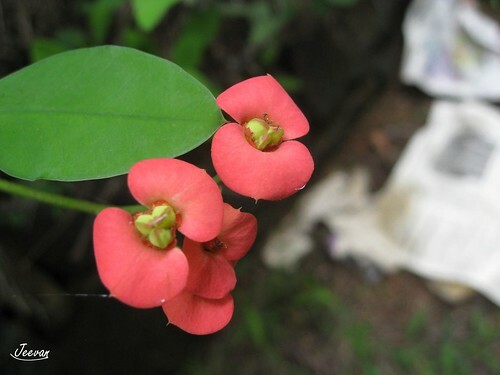 The woody, spiny and climbing succulent shrubs growing up to 6 feet in height and leaves that are found new growth has flowers shaped in small conspicuous pair of petal-like bracts in red, which also variably pink or white. As it was raining last night, everywhere it looks green and surprisingly clean. A couple of foreign girls came across us and seeing our pet, one come close to say cute and wanting to know will she bite, asked mom blindly ‘bite’ brought blink and think sophisticated! I observed a spider web and it was interesting to note how they climb their net and move. I never seen spider practice with web and caught up with things, as I would be away if a spider comes near me. The oak grove is pretty to walk and to capture by standing in the narrow lines that extends like no end, but we didn’t complete the whole area and don’t know how length the road leads between the grove’s that pass hardly by any vehicle. Everywhere it’s talk about Endhiran and its post and pre-release celebrations elsewhere. I personally feel the hype created by media and Sun picture’s is causing too much expectation and irritation among people. 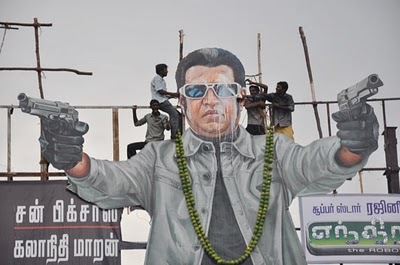 The fans celebrate it and Endhiran is not alone a movie to receive such abundance and every superstar’s release witnesses such enthusiasm and eagerness, but it defines larger this time as it involves the larger heads in movie industry including the subject. Even missing the common wealth games excitement in country, many TVs tuned for watching the Endhiran movie release functions worldwide. Even I felt bad to say that I missed a vivid glow evening on doordarshan, watching our nation been displaying its very big and grand venue, were India shines very brightly like Sirius in the universe. The movie has talked much before it release and there’s nothing to say more about it and keeping away the suspect on hype and expectation, peoples response are overwhelm and speechless as of ever seeing a movie like this before in Tamil cinema. It’s quite shanker movie in my view primarily where superstar might displayed like a super doll doing everything need for his character and fans. He’s general hero of almost everyone like him for his style and simplicity, and being super hype whatever he do are expose to publicity. The director has used this hype with strong media background; the movie is published with lot of expectations and causing disturbance in many ways to public. Thought we enjoy the hyper create by the fanfare, there is something for people to carry unmindful and do crazy which I like to dismiss and think media should stop encouraging such stupid activities. I guess people are much endures to bear the movie’s non-stop publicity, sponsor by the Sun group of channels, which sounds aloud in-between watching programs, should think a good movie no need publicity and it will reach people by some ways through themselves. Don’t we listen to our neighbors and near and dear ones who watch the movies, but even though we need little aware about the movies which caused by the media, should be responsible and care to be publishing it in interesting and not irritating anybody. Looking forward to watch the robot with little expectation on Shanker and Superstar!